Welcome to Part 2 of this series on building an extendable calendar in Vue.js. I’m very excited to share a technique commonly used to functionally extend Vue.js components. If you come from the legacy desktop world as I do, you may have had some trouble when trying to re-implement some of the older techniques you’re more accustomed to when trying to reuse user interface components. I mean, is there subclassing in Vue?…would that be overkill…or should you just create a parent component that wraps your original one and reimplements all of the UI?…what to do, what to do? The good news is that Vue.js has our back in more ways than one, and in this tutorial we’ll explore one of the features it provides to add some of that flexibility we want. To do that, we’ll look at implementing a useful feature for our calendar component: date selection. Specify for the component which selection mode we would like to use as well as the current selection value we would like for it to display, all while supporting the v-model syntax. Specifically, accept a value prop and emit an input event when value needs to be updated. Identify if a given day of the month falls within the value selection. This function must get called for every day displayed in the calendar. As the user interacts with the calendar, such as when selecting, deselecting, or dragging across day cells, the component should notify the parent component that the selection has been updated. To execute on this plan, we can then see what a skeleton of our refactored component might start to look like. With this skeleton we have met the operational requirements, but there is some code smell here. Sure, it gets the job done, but there are some flaws with this approach. We are over-extending the singular job to be done by our calendar. It currently provides a layout structure for header, weekday, and day cells with associated state information for a given month and year. It serves that purpose well. Now we’ve tasked it with managing date selection state. The logic to support any particular selection mode is scattered throughout the component. Just look at all of those switch statements at every step of the process. Also, that enterDay(day) method is only needed for the range selection mode. And we’ll probably need some custom computed properties for each mode as well. In short, the goal is to have one place we can go to see all the logic for implementing a particular selection mode feature. This design falls short of that goal. This approach is not scalable. Let’s say we would like to implement another custom selection mode in the future. Or maybe we would like to use this component as an event calendar instead of a simple date picker. That would mean a lot more specialized code scattered throughout our component, muddying it up even more. 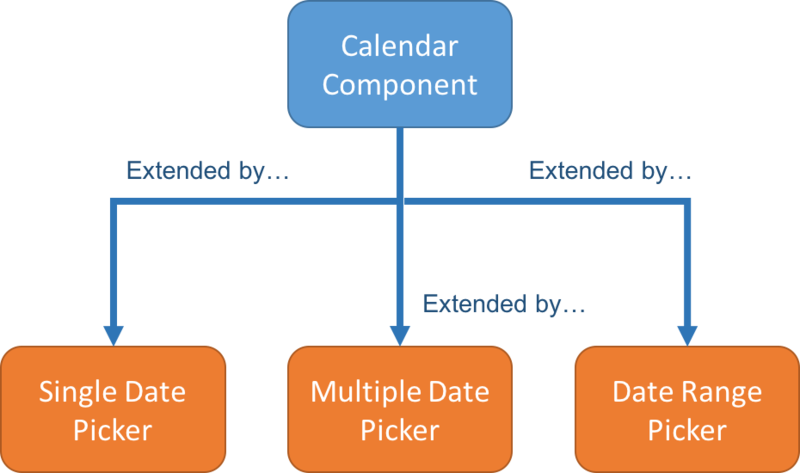 So to restate the problem, what we need is a way to functionally extend our calendar component in multiple ways ("single" date, "multiple" date and date "range" selection), each implemented in an abstract and centralized manner that don’t intrude upon the component implementation itself. Sounds like a daunting task. First, we should acknowledge that what we are trying to do with our calendar component essentially changes its core function. It is a calendar and we would like to keep it that way. We are now transforming it into different kinds of date pickers. Making this subtle but important distinction could save us heartache in the future when we decide to use it to display events, for example. Let’s use a diagram to help us get a bigger picture for what exactly we are trying to accomplish. Vue supports the ability to easily inherit functionality from other components by ‘extending’ them. This means we can define custom components, each with their own options (lifecycle hooks, props, data, computed properties, methods, etc) that are essentially merged with the options from the original component. The great thing to keep in mind here is that we get the same reactivity with the extended options as if they were part of the original component itself. If you know much about Vue, extending components might sound very similar to mixins. And honestly, they do much of the same thing, albiet in a different way. The best advice I can give (and others should feel free to comment on this) is that mixins in general shouldn’t be aware of the context in which they are used, whereas extending is more in line with traditional subclassing. I’ll refer you to Vue’s own documentation to get a better idea of when mixins might be a better option for your situation. For our calendar, we’ll go with component extension as our date pickers do assume that they are used within the context of our calendar component. Let’s start with our first extended component, the single-date-picker. By abstracting out the logic into a separate component, our original calendar component is allowed to focus on what it does best. We now have a centralized object we can refer to in order to see how single date selection is implemented. This will be a great benefit for yourself or others when this feature is debugged or modified later. That extends option is what flags Vue to do the extension magic. The selectDay(day) methods emit an input event rather than assigning the value itself, keeping it in-line with the unidirectional data flow. Let’s discuss those the event handlers in the created() lifecycle method. In this example, we are using events to provide an interface between our base calendar component and any extending components. While we could directly call some generically defined methods from within our calendar component and require that our extending components override them, this approach introduces some subtle limitations that are not completely obvious at first. Simply put, it tightly couples the base component with extending components in various ways. Additionally, we would like to provide the ability for parent components that consume our calendar/picker components to hook into some of this functionality as well. Events can serve as a loosely coupled mechanism by which our base component can interface with its extending and parent components at the same time. For example, the configureDay(day) event supports other components’ abilities to append state data needed for their own feature. So hopefully that goes a little ways on explaining the benefits that extending components provides. My advice is to give it a try and see for yourself. Let’s move on to the multiple-date-picker component. And finally the date-range-picker component. The only real difference with the range picker component is that we listen for the enterDay(day) event, which gets raised when the user’s mouse cursor enters (as it moves over) a day cell. It is reasonable for the calendar component to raise this event, as you could imagine other components being able to utilize this event as well? Finally, let’s not forget to honor the base calendar component’s side of the contract by raising those events. Reference line 45 for changes to the weeks computed property. We can emit the remaining events directly from the template (lines 24–26). At this point, we have successfully extended our calendar into multiple date picker controls, whilst taking care to be as minimally invasive of our base calendar as possible. I highly recommend extending your components as much as reasonably possible. If, throughout this tutorial, you were left wishing that you could just combine the three picker components into one, I would recommend that you reference the CodePen below. It uses a dynamic component to switch out the pickers on the fly, depending on which selection mode is specified. I would recommend combining them using this approach rather than embedding all of the logic together in a simple component, but obviously you are free to combine them however you would like. In the next and final part of this series, we’ll move into extending our component visually so that we can easily apply our calendar and date pickers within different design contexts. See you then.